Located in the tony 90210 zip code of Beverly Hills, this luxury estate home boasts a detached 15 Car Garage with drive through capabilities. The garage was built approx. 40 years or more after the original house was built in this neighborhood and the total size of the garage is not visible from the street. It looks like a two car garage, once you look into the steel gated driveway and the stone arch way that are part of the driveway. 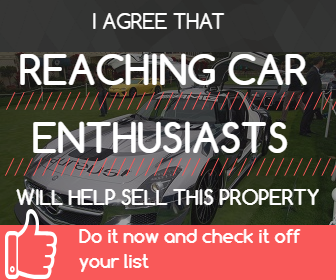 Bruce Meyer, is a real estate developer who is much better known as a supreme car guy in the Los Angeles area and in car collector circles nationwide. Bruce is the Chairman of the Rodeo Drive Concours d'Elegance and a participant in many car shows and events throughout the west. Bruce also is on the board of several non-profit groups benefiting the car collector hobby, such as LeMay, America's Car Museum in Tacoma, WA. Even though Bruce collects many types of cars and motorcycles, he has become known in recent years as a major Hot Rod collector and purveyor of Los Angeles' Hot Rod history and heritage. He has been seen on several Discovery network (Velocity) shows and as you'll see from one of the videos below he has been speed testing one of his latest hot rods. Californian Bruce Meyer is really into collecting cars, particularly hot rods. But Meyer is not content to just let his cars sit--he wants to drive. One of his latest efforts was taking a modified 1932 Ford roadster to the Bonneville Salt Flats in Utah in a bid to break the 200-mph mark. With the help of this video production, we get to go along. Meyer's car, wearing No. 747, is powered by a reworked Chevrolet 427-cubic-inch V8, and was engineered by his friend Mike Cook. This was not Meyer's first taste of the salt at Bonneville. In 2010 he drove a modified Chevrolet Camaro to 222 mph. But he wanted to try again, this time in an open-cockpit car. Meyer makes three passes in the No. 747. He blows past 200 mph, but by how much? The video will show you. In late summer of 2012, during Speed Week a the Bonneville Salt Flats, Bruce Meyer climbed into his 747 Roadster hoping to exceed 200mph. In order to acheive this speed Bruce could Never Lift. Price Information: For fun and display only, please enjoy and pass this link along to your friends. Garage Description A great place to hang out and work on the vast kinds of collector cars and motorcycles that most collectors and enthusiasts would love to own or drive.